Young children really like toys which are snuggly, comfy and adorable. When it is time for bed, they also want a soft pillow for sleeping. You can now posses both of those factors in just a single product. If you happen to want to give your young children a play toy that he or she can actually sleep on, then the Happy Nappers could be the solution. It’s both a fun toy as well as a pillow too. Every Happy Napper were made to appear to be like the home of the animal. There is a barn that turns into a cow. There’s also the castle pillow turns into the dragon. There’s also a bungalow becomes a pink and black ladybug. An igloo becomes a penguin. The dog and doghouse. And a magical palace that turns to a unicorn. Every single sleepy sound is special based on which animal it happens to bel. 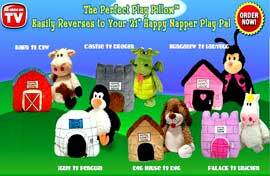 Your kids will really like playing with the Happy Napper Pillow. Each kid would have her or his own favorite choice. When it is time to go to sleep, let them give their toy a hug and transform it to a pillow. Happy Nappers are perfect to carry along for long trips, when your children sleep over at friends, or merely for sleeping in their own home.